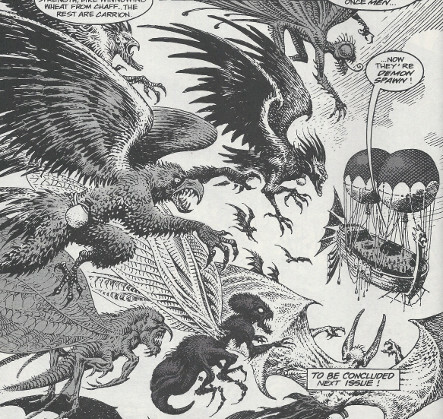 Powers/Abilities: The Blood-Children had various monstrous forms, with physical abilities intrinsic to those forms, such as flight if they possessed wings; others possessed claws, sharp-teeth, thickened flesh/scales, extra limbs, a tail, etc. Traits: The Blood-Children were extensions of the will and persona of Ovada. They acted primarily to infect others with Ovada's or their own blood, which would transform their victims into new Blood-Children, under Ovada's influence. They also acted to battle others under Ovada's direction. They spread out in all directions from Ovada's corpse, slaying those they felt too weak to serve as hosts and infecting any others they could. (Conan the Savage#5 - BTS / Conan the Savage#6 (fb) - BTS) - Ovada's enemies cast her from their godly room realm. Fatally wounded, her immense form hurtled downward from Earth's sky before crashing atop a mountain and lying in supine recumbency. Her right hand, at least, rested in a mountain stream, and her blood drained into its waters. To escape god-death, Ovada bonded her consciousness into her blood, and the blood-tainted waters then passed into a waterfall and spread into lower streams, which reached the surrounding villages. (Conan the Savage#6 (fb) - BTS) - The tainted water was first imbibed by Tara Alarune, who became the host to Ovada'a spiritual essence. Ovada invested her core essence into Tara's form to command the others that followed: all that consumed the blood-tainted water were transformed into monstrous form and became her blood-children. All of her blood-children were fragments of herself, and the children of her blood would beget children of their own; but, "the seed and the sower are one and the same." (Conan the Savage#6 (fb) - BTS) - Tara/Ovada apparently remained in proximity to Ovada's corpse, using its hollowed out form as a base. As Ovada plotted that her blood-children would spread her taint across Earth and those beyond until all life was part of her, she hoped to defeat her celestial brethren beneath their very noses. (Conan the Savage#5 (fb)) - The night after the great storm, one of Ovada's blood-children was found in the city of Jarabesht, in the Northern Plains. Some of Jarabesht's people, possibly including Akif, caught the creature emptying some vile brew into the city wells. (Conan the Savage#5 (fb) - BTS) - The people of Jarabesht put the creature to the sword. 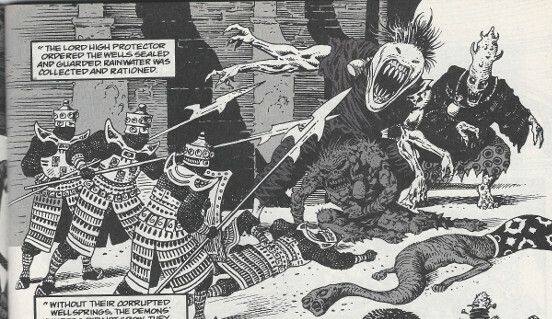 (Conan the Savage#5 (fb)) - Soon after, those who drank the tainted water became demonic blood-children as well. They spread rapidly, hunting in packs and forcing others to take "the taint," further swelling their filthy ranks. Soon the city belonged to the blood-children. The people were besieged from within. (Conan the Savage#5 (fb) - BTS) - The Lord High Protector ordered the wells sealed and guarded, and rainwater was collected and rationed. 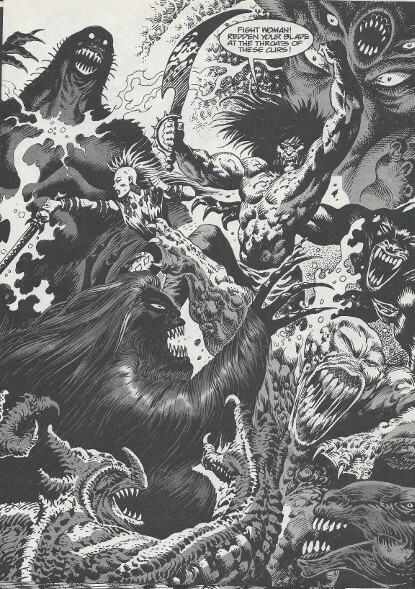 (Conan the Savage#5 (fb)) - Without their corrupted wellsprings, the demons numbers stopped growing, and they became easy prey for the warriors. Those they captured alive were taken to his Lordship to study and "read their vittles." (Conan the Savage#5 (fb) - BTS) - Jarabesht was shuttered and barred, and "foreign devils" were prohibited from entering by order of the Lord High Protector. (Conan the Savage#5 (fb) - BTS) - An army of demons was sweeping down from the mountains, laying waste to all before them and corrupting all they found. (Conan the Savage#5 (fb) - BTS) - Akif's scouts reported the demon army to be not 5 days ride from Jarabesht, and Akif put the city on alert; every man, woman, and child was ready to fight to the bitter end. (Conan the Savage#5 - BTS) - Akif helped his friend Conan -- who had departed the town a month earlier to seek bounty on Thorun and his sons -- re-enter Jarabesht and then told him what had happened. Conan agreed to aid Akif in the coming battle, and they both soon joined the Lord High Protector in a mission to cut off the demons at their source; they were joined by, among others, Siobahn Lauchline of the Sisterhood of Danu, as well as the Protector's Leathermen. The Lord High Protector carried his allies toward the mountain via a wooden ship borne aloft by levitation globes, but then proclaimed that his abilities could only convey them so far; they must travel the final league on foot. 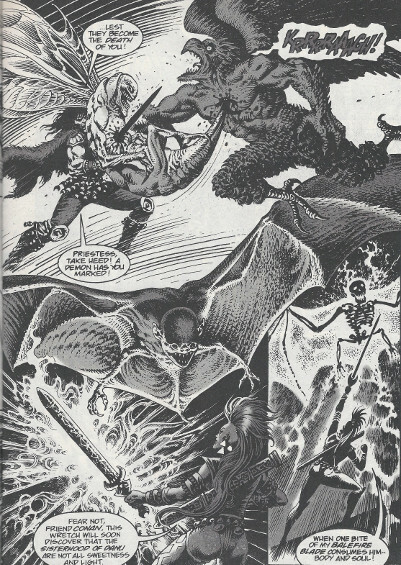 (Conan the Savage#5) - As they approached a place to land, however, a horde of winged demon creatures approached them. 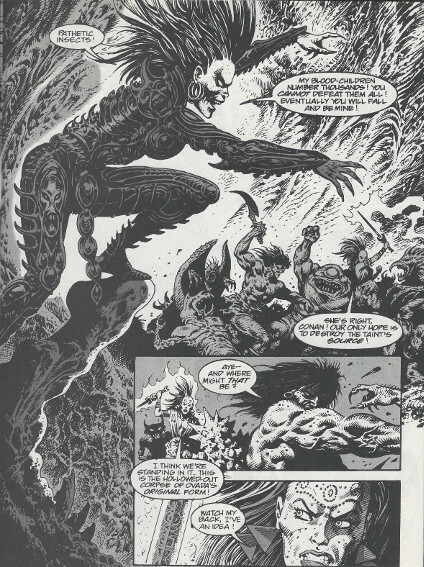 (Conan the Savage#6) - Conan and Siobahn slew several of their assailants, but one of them skewered Akif (catching him on his blind-eye side) into one of the levitation globe's causing the ship to fall sideways and dump most of its inhabitants. (Conan the Savage#6 - BTS) - The Lord High Protector and Conan caught some of the remaining globe's ropes, and Conan caught Siobahn; the rest presumably fell to their doom. The Lord High Protector, fearing their weight would slow his ascent and ability to escape from further attacks, cut the ropes supporting them (as well as the ropes attaching the remaining globe to the ship). Conan, Siobahn, and the ship crashed to the ground below; their descent was cushioned somewhat by the ship to which they were still attacked, and then by a large tree the ship struck, but they were nonetheless knocked unconscious upon hitting the ground. 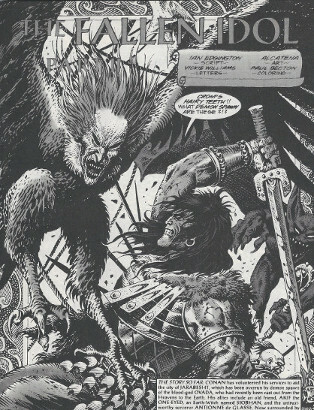 (Conan the Savage#6) - They were approached by at least one of Siobahn's blood-children. (Conan the Savage#6 (fb) - BTS) - Ovada's blood-children brought Conan and Sioban into the hollow inside of Ovada's corpse, where their arms were bound using tissue from her body wall. (Conan the Savage#6 (fb) - BTS) - Ovada's blood-children captured the Lord High Protector as well; they brought him within Ovada's hollow corpse, where he was similarly bound. (Conan the Savage#6) - After the captives recovered and the Lord High Protector explained that they were within the demon horde's wellspring, Tara introduced herself and named herself as the vassal to Ovada. Explaining that their forces were legion, she asked what chance they thought they stood against Ovada and her blood-children. The Lord High Protector sought to spare himself by offering to help her with his knowledge and power, but "Tara" told him he had nothing she would want. When Conan told her to kill them to spare them the headache of listening to her, Tara told him they would not die, but rather sup of Ovada's lifeblood and be reborn as she was, from a callow farm girl to the handmaiden of a mighty goddess. Able to sense Ovada's thoughts, Siobahn advised Conan that she was lying and that she was not, in fact, an acolyte, but rather Ovada herself. Ovada admitted the truth in this, as taking this suit of flesh was the only way she could escape god-death. She revealed her history and plans, countering Siobahn's argument that not even she could corrupt so many by explaining how her children would spawn more children (presumably via their own blood). Tara/Ovada then demanded Siobahn drink of her lifeblood, but Siobahn refused, and Conan kicked "Tara" back, causing the chalice to spill its contents on the face of Tara/Ovada. Enraged, Tara/Ovada ordered her guards to eviscerate them, but Conan dodged a two-faced monster's sword thrust, instead moving it into the way of his bonds and then claiming the sword to slay the monster before cutting Siobahn free. The Lord High Protector asked for their aid, but they mocked him and left him behind. Siobahn reclaimed her Balefire Blade from the demon who had taken it from her unconscious form, and she and Conan were soon in the midst of numerous blood-children. Tara/Ovada taunted them, telling them her blood-children numbered thousands, and eventually they would fall and be hers. Realizing that they must stop the taint's source, which they were within, the hollowed out corpse of Ovada's original form, Siobahn led Conan to Ovada's body wall and then slashed an exit with her Balefire Blade, in the processing setting Ovada's corpse aflame with the Balefire. The blood-children within soon burst into flames, and Siobahn and Conan leapt out the hole she had created, ignoring the Lord High Protector's pleas to save him. Refusing to accept defeat or to lose her life to the likes of these mortals, the badly burnt Tara/Ovada released Ovada's core essence and then recalled all of the rest of the fragments of her essence, reuniting them all back into Ovada's immense form. I'm giving Tara and the blood-children their own profiles, as there are just way too many images to fit into this profile. Siobahn will also get her own profile, too...as will the Lord High Protector, probably Akif, and maybe Thorun and his sons...and maybe Jarabesht...who knows!